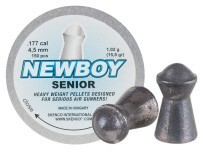 Seneca 16.1-grain .177-caliber pellets are a hefty load recommended only for very powerful precharged pneumatic guns. Do not use them in spring guns, multi-pump pneumatics, CO2 guns or single-stroke pneumatics (you'll get very poor accuracy if you do). Please note the guns listed in the above bulleted list and use these pellets for those powerful PCP rifles and other PCPs with similar power levels. 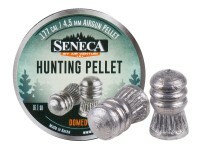 These .177 caliber pellets from Seneca deliver the performance required for small game hunting or target practice. 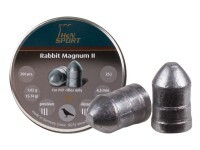 Each domed round weighs in at a 16.1gr. 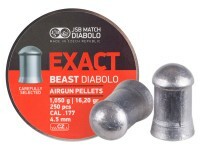 220 pellets per package. Things I liked: Delivers a powerful punch. Despite what the description says, I use these in my Daisy 880. They work flawlessly out to about 20 yards. Accurate and powerful. All you need for squirrel patrol. Things I would have changed: Many lead fragments in the tin. Need to be cleaned before shooting. But, don't fix something that isn't broken. What others should know: Accurate and powerful. I believe it will sting squirrels. I have a daisy 880 and a Crosman 660 that I’ve had since the 70’s. They shoot BB’s about 700 fps. I have a chronograph, but never shot over it with the 880 or the 660. Things I liked: Very accurate and quiet in my Benjamin Mayhem .177.